I remember while growing up, we were usually surrounded by lots of trees. Each compound usually had different types of trees planted. As as sport after school hours, when the fruit ripens on the trees, my friends and i would climb these trees to pluck the fruits. We read lots of Adventure books back in the day so it was quite easy for us to fit into imaginary scenarios concocted in our heads. One of the easiest trees to climb back then was the mountain apple tree botanically known as Syzygium malaccense. 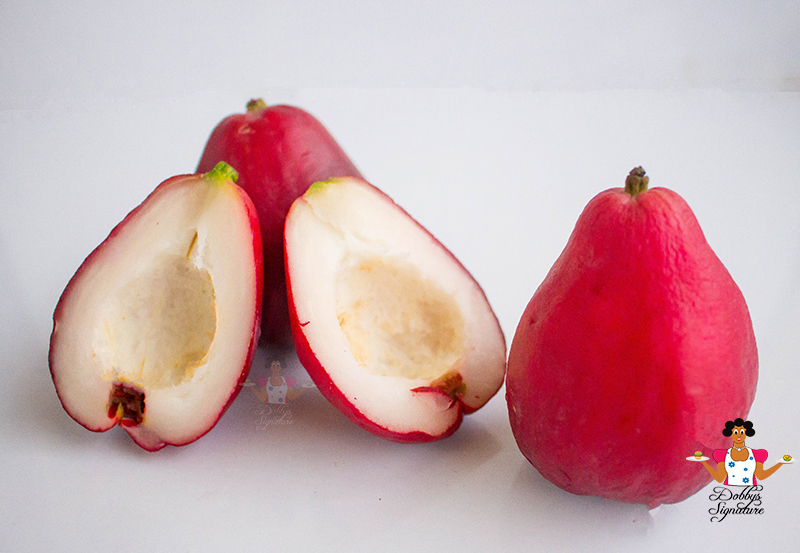 It goes by different names such as ; rose apple fruit, Otaheite cashew and pommerac. The first sign that harvest is near is when the lightly fragrant flowers bloom and sprout all over the place. They transform the ground underneath the tree into a beautiful pink carpet. The fruits were easily reached because the trees don't grow too high and the fruits look like clusters of red or pink light bulbs when ripe. 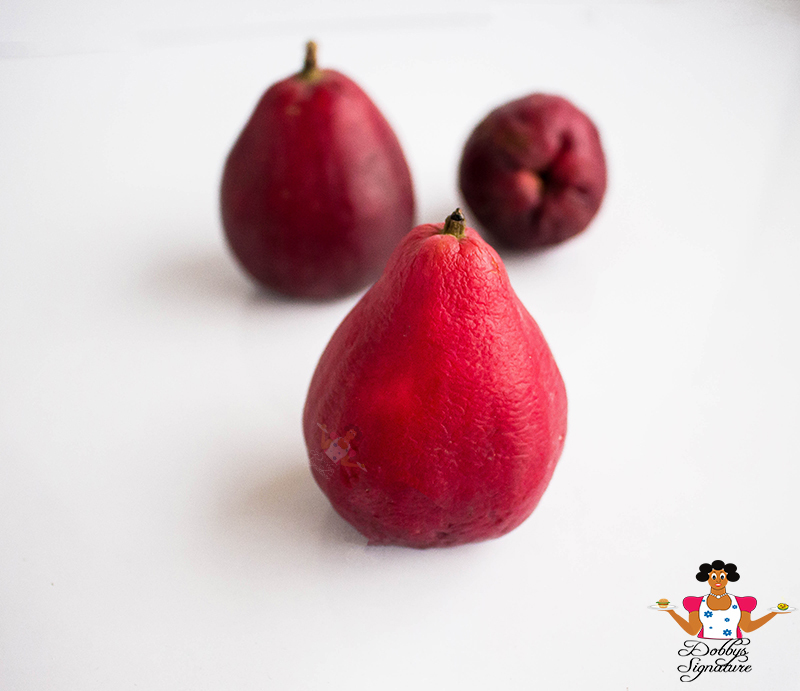 The fruit is pear-shaped with a dark red color, although there are some varieties have white or pink skins. The ripe mountain apple fruit tastes sweet. The flesh is soft and slightly crunchy. You don’t have to peel the skin, just bite into the fruit as if you are eating an apple! - It can be used to prepare jam by stewing the flesh with brown sugar and ginger. - It can be pickled and served with grilled fish or meat. - The over ripened fruits can be made into a syrupy sweet wine. - When cooked with fresh ginger, lemon juice, cinnamon and then smoothly processed in a blender, they make a delicious mountain applesauce. - It can be juiced, made into a smoothie or added to a fruit salad. Do you know this fruit? What is it called in your Language? What I'd do to get my hands on this fruit right now!... Dobby, please, where can I get this in Lagos? lol! you can get it from the local market once it's in season. 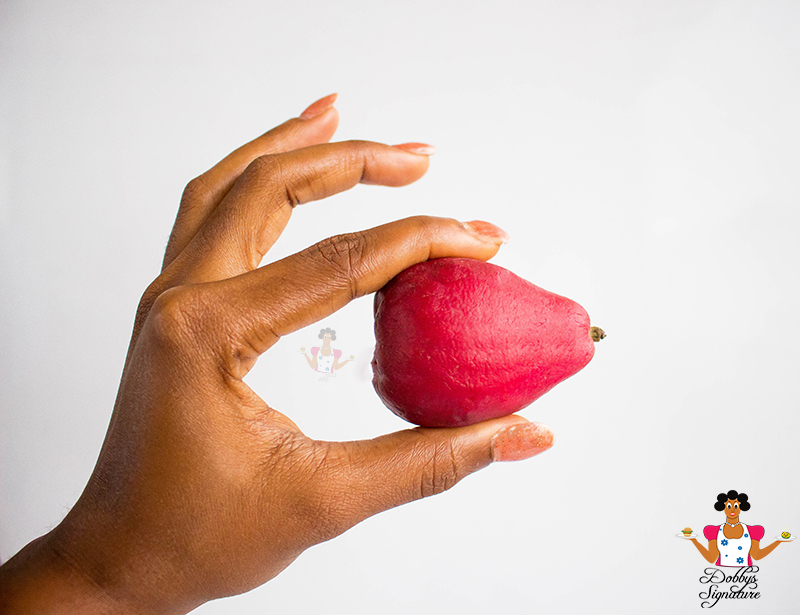 Most people are more familiar with the pink version of this fruit. I do know the fruit and I remember eating it when I was young. We call it African apple. Ish, please tell me about the fruit so i can order for it online. Really loving this friut. It's quite common when it's in season. Most people are more familiar with the pink version of this fruit. omg...this is one of my absolute favourite fruits...im from Jamaica ,,it is very popular there..we call it "apple".